Away with cubicles, away from the maddening crowd is what the design implies. 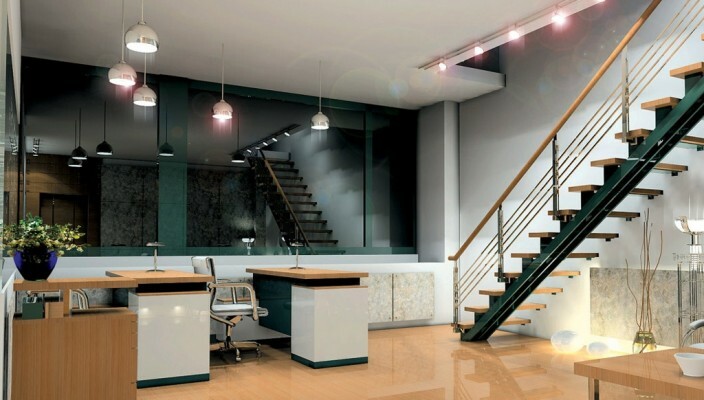 A two desk small office to accommodate few employees is evident in this office design. The reception area is simple with a wooden coffee table suitable for a centerpiece. A side table ideal to have room for emergency office supplies is used as a display unit softened with a beautiful office interior plant. The color scheme of the walls is neutral but the black glass breaks the simplicity in this office design. Lighting and fixtures are an interesting blend strategically positioned where required. Artistic vases and other forms of décor highlight the entire office. The anti skid flooring with a wooden glow blends with the furniture. The steps on the staircase are wooden and the railings are of treated steel. As you walk up to the additional office space you are met with a large office ideal for the senior executive’s private space.